ROOT CANAL TREATMENT CAN HELP YOU SMILE AGAIN! Imagine waking up pain free and with a radiant smile every day of your life. How would you feel? Ready to take on the world, to live your best life? That’s how we want you to feel. Pain shouldn’t be a factor in your life, especially when it comes to your teeth, mouth and gums. Our dentists are committed to helping you achieve a life without dental pain, and root canal therapy is as much about saving the tooth as it is about reducing your pain. Why would you need a root canal treatment? 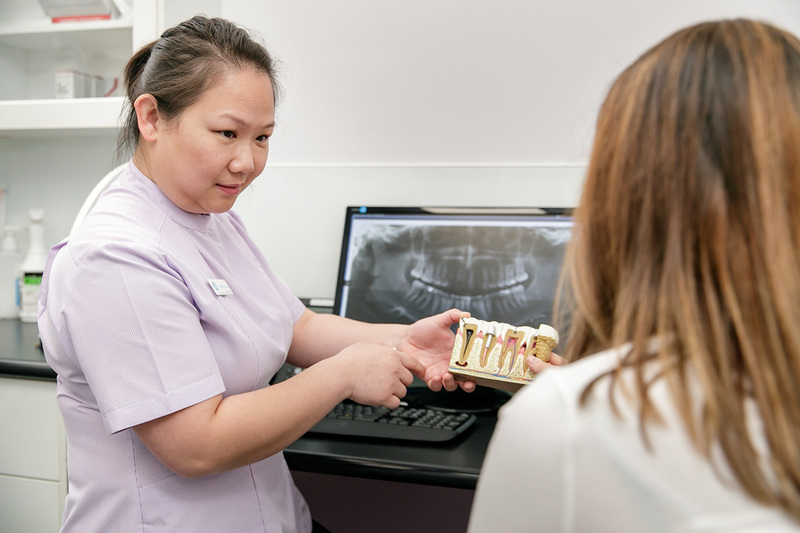 The most common reasons why you would need root canal therapy include a hard knock to the teeth, cracked tooth or deep cavity leading to infection or abscess in the jaw bone. When decay or fractures have caused irreversible damage to the pulp of the tooth (where the nerve of the tooth lives), the pulp will continue to die and an infection occurs. To remove this dental infection, a tooth either needs to be extracted or the infected pulp along with the offending infection needs to be cleared from the tooth and jaw bone. Root canal treatment allows us to remove the cause for infection without having to remove or lose the entire tooth. In other words, root canal treatment saves teeth that would otherwise need to be extracted. We need to clean and disinfect the pulp canal of the tooth, before finally sealing the space where the nerve was with a filling. By sealing the root canal, bacteria is blocked from re-entering the tooth and causing further pain. The tooth will then need to be restored and rebuilt so it is strong and durable, typically either using a large filling or crown. A root canal treatment secured with a strong crown helps to extend the life of the broken and infected tooth. FAST FACT: It was in 1905, that dental assistant Irene Newman became the first dental hygienist in history.